Bird flu has been found at a second Romanian village 30km (20 miles) from the first site, officials say. Results showing whether this case, or the earlier confirmed outbreak, is the lethal H5N1 strain found in Turkey are expected in the coming days. The World Health Organization says there is a high probability that the first birds did carry that strain. The news comes as EU veterinary officers hold an emergency meeting to discuss measures to contain bird flu. 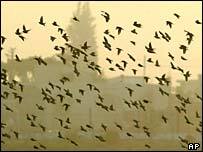 In Turkey and Romania, the sites of bird flu infection have been close to areas favoured by migratory birds. The Romanian agriculture ministry confirmed on Friday that two birds in Maliuc had tested positive for the H5 strain. Romanian authorities have finished culling birds in Ceamurlia de Jos, the site of the first Romanian outbreak, and are starting to do so in Maliuc as a precaution. The EU veterinary officers meeting in Brussels are looking at measures to try to reduce the chance of contact between wild birds and poultry in high-risk areas, which could include requiring some poultry to be kept inside. A separate EU meeting of bird flu experts is expected to issue advice on the potential risk for humans who come into contact with migratory birds. Your say: Cause for concern? EU foreign ministers are to hold emergency talks on the bird flu threat on Tuesday when they meet in Luxembourg for WTO negotiations. 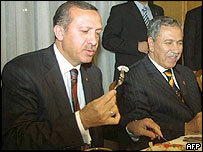 The European Commission has banned imports of live birds and poultry products from Turkey and Romania. European countries are being urged to stockpile anti-viral drugs after it was confirmed that avian influenza found in Turkey was the H5N1 type that can be fatal to humans. In the Turkish and Romanian capitals, some pharmacies have run out of anti-flu medicines because of heavy demand. Production of the drug Tamiflu, identified as a prime weapon against bird flu, will be doubled by the end of the year, maker Roche has said. Turkey's Agriculture Minister, Mehdi Eker, insisted measures were in place to contain the bird flu found in Kiziksa, 120km (80 miles) south-west of Istanbul. He said more than 5,000 birds had been slaughtered and a safety cordon would remain in the area for three weeks, unless more cases were reported. Nine people are under medical observation after reports that 40 pigeons in their neighbourhood died in mysterious circumstances. All nine are from Manisa, which is close to the village where the fatal H5N1 strain of bird flu was identified this week. The nine are being monitored as "a precaution", officials said. Turkey's environment ministry has banned the hunting of wild birds amid fears hunters could catch bird flu from them. EU Health Commissioner Markos Kyprianou has warned that the EU should be ready for a potential human flu pandemic. The H5N1 strain has killed more than 60 people in South East Asia since 2003. However, of those only one is suspected to have died after catching the virus from another human.